Iqbal Jameel, Sun Li, Cao Jay, Yuen Tony, Lu Ping, Bab Itai, Leu N Adrian, Srinivasan Satish, Wagage Sagie, Hunter Christopher A, Nebert Daniel W, Zaidi Mone, Avadhani Narayan G: Smoke carcinogens cause bone loss through the aryl hydrocarbon receptor and induction of Cyp1 enzymes. Proceedings of the National Academy of Sciences of the United States of America 110(27): 11115-20, Jul 2013. Bajpai Prachi, Sangar Michelle C, Singh Shilpee, Tang Weigang, Bansal Seema, Chowdhury Goutam, Cheng Qian, Fang Ji-Kang, Martin Martha V, Guengerich F Peter, Avadhani Narayan G: Metabolism of 1-methyl-4-phenyl-1,2,3,6-tetrahydropyridine by mitochondrion-targeted cytochrome P450 2D6: implications in Parkinson disease. The Journal of biological chemistry 288(6): 4436-51, Feb 2013. Bansal Seema, Anandatheerthavarada Hindupur K, Prabu Govindaswamy K, Milne Ginger L, Martin Martha V, Guengerich F Peter, Avadhani Narayan G: Human cytochrome P450 2E1 mutations that alter mitochondrial targeting efficiency and susceptibility to ethanol-induced toxicity in cellular models. The Journal of biological chemistry 288(18): 12627-44, May 2013. Sleeper Meg M, Rosato Bradley P, Bansal Seema, Avadhani Narayan G: Mitochondrial dysfunction in myocardium obtained from clinically normal dogs, clinically normal anesthetized dogs, and dogs with dilated cardiomyopathy. American journal of veterinary research 73(11): 1759-64, Nov 2012. Ren Ling, Hong Sung-Hyeok, Chen Qing-Rong, Briggs Joseph, Cassavaugh Jessica, Srinivasan Satish, Lizardo Michael M, Mendoza Arnulfo, Xia Ashley Y, Avadhani Narayan, Khan Javed, Khanna Chand: Dysregulation of ezrin phosphorylation prevents metastasis and alters cellular metabolism in osteosarcoma. Cancer research 72(4): 1001-12, Feb 2012. Bansal Seema, Srinivasan Satish, Anandasadagopan Sureshkumar, Chowdhury Anindya Roy, Selvaraj Venkatesh, Kalyanaraman Balaraman, Joseph Joy, Avadhani Narayan G: Additive effects of mitochondrion-targeted cytochrome CYP2E1 and alcohol toxicity on cytochrome c oxidase function and stability of respirosome complexes. The Journal of biological chemistry 287(19): 15284-97, May 2012. Tang Weigang, Chowdhury Anindya Roy, Guha Manti, Huang Li, Van Winkle Thomas, Rustgi Anil K, Avadhani Narayan G: Silencing of IkBβ mRNA causes disruption of mitochondrial retrograde signaling and suppression of tumor growth in vivo. Carcinogenesis 33(9): 1762-8, Sep 2012. Srinivasan Satish, Avadhani Narayan G: Cytochrome c oxidase dysfunction in oxidative stress. Free radical biology & medicine 53(6): 1252-63, Sep 2012. Avadhani Narayan G: Targeting of the same proteins to multiple subcellular destinations: mechanisms and physiological implications. The FEBS journal 278(22): 4217, Nov 2011. Raza Haider, Prabu Subbuswamy K, John Annie, Avadhani Narayan G: Impaired mitochondrial respiratory functions and oxidative stress in streptozotocin-induced diabetic rats. International journal of molecular sciences 12(5): 3133-47, 2011. Yan Carol, Avadhani Narayan G, Iqbal Jameel: The effects of smoke carcinogens on bone. Current osteoporosis reports 9(4): 202-9, Dec 2011. Avadhani Narayan G, Sangar Michelle C, Bansal Seema, Bajpai Prachi: Bimodal targeting of cytochrome P450s to endoplasmic reticulum and mitochondria: the concept of chimeric signals. The FEBS journal 278(22): 4218-29, Nov 2011. Iqbal Jameel, Zaidi Mone, Avadhani Narayan G: Cell signaling. Annals of the New York Academy of Sciences 1211: 3-8, Nov 2010. Sangar Michelle Cook, Anandatheerthavarada Hindupur K, Martin Martha V, Guengerich F Peter, Avadhani Narayan G: Identification of genetic variants of human cytochrome P450 2D6 with impaired mitochondrial targeting. Molecular genetics and metabolism 99(1): 90-7, Jan 2010. Guha Manti, Tang Weigang, Sondheimer Neal, Avadhani Narayan G: Role of calcineurin, hnRNPA2 and Akt in mitochondrial respiratory stress-mediated transcription activation of nuclear gene targets. Biochimica et biophysica acta 1797(6-7): 1055-65, Jun-Jul 2010. Srinivasan Satish, Koenigstein Alexander, Joseph Joy, Sun Li, Kalyanaraman B, Zaidi Mone, Avadhani Narayan G: Role of mitochondrial reactive oxygen species in osteoclast differentiation. Annals of the New York Academy of Sciences 1192: 245-52, Mar 2010. Bansal Seema, Liu Chuan-Peng, Sepuri Naresh B V, Anandatheerthavarada Hindupur K, Selvaraj Venkatesh, Hoek Jan, Milne Ginger L, Guengerich F Peter, Avadhani Narayan G: Mitochondria-targeted cytochrome P450 2E1 induces oxidative damage and augments alcohol-mediated oxidative stress. The Journal of biological chemistry 285(32): 24609-19, Aug 2010. Sangar Michelle C, Bansal Seema, Avadhani Narayan G: Bimodal targeting of microsomal cytochrome P450s to mitochondria: implications in drug metabolism and toxicity. Expert opinion on drug metabolism & toxicology 6(10): 1231-51, Oct 2010. Sondheimer Neal, Fang Ji-Kang, Polyak Erzsebet, Falk Marni J, Avadhani Narayan G: Leucine-rich pentatricopeptide-repeat containing protein regulates mitochondrial transcription. Biochemistry 49(35): 7467-73, Sep 2010. Guha Manti, Fang Ji-Kang, Monks Robert, Birnbaum Morris J, Avadhani Narayan G: Activation of Akt is essential for the propagation of mitochondrial respiratory stress signaling and activation of the transcriptional coactivator heterogeneous ribonucleoprotein A2. Molecular biology of the cell 21(20): 3578-89, Oct 2010. Guha Manti, Pan Hua, Fang Ji-Kang, Avadhani Narayan G: Heterogeneous nuclear ribonucleoprotein A2 is a common transcriptional coactivator in the nuclear transcription response to mitochondrial respiratory stress. Molecular biology of the cell 20(18): 4107-19, Sep 2009. Dong Hongbin, Dalton Timothy P, Miller Marian L, Chen Ying, Uno Shigeyuki, Shi Zhanquan, Shertzer Howard G, Bansal Seema, Avadhani Narayan G, Nebert Daniel W: Knock-in mouse lines expressing either mitochondrial or microsomal CYP1A1: differing responses to dietary benzo[a]pyrene as proof of principle. Molecular pharmacology 75(3): 555-67, Mar 2009. Wegrzyn Joanna, Potla Ramesh, Chwae Yong-Joon, Sepuri Naresh B V, Zhang Qifang, Koeck Thomas, Derecka Marta, Szczepanek Karol, Szelag Magdalena, Gornicka Agnieszka, Moh Akira, Moghaddas Shadi, Chen Qun, Bobbili Santha, Cichy Joanna, Dulak Jozef, Baker Darren P, Wolfman Alan, Stuehr Dennis, Hassan Medhat O, Fu Xin-Yuan, Avadhani Narayan, Drake Jennifer I, Fawcett Paul, Lesnefsky Edward J, Larner Andrew C: Function of mitochondrial Stat3 in cellular respiration. Science (New York, N.Y.) 323(5915): 793-7, Feb 2009. Chandran Karunakaran, Aggarwal Deepika, Migrino Raymond Q, Joseph Joy, McAllister Donna, Konorev Eugene A, Antholine William E, Zielonka Jacek, Srinivasan Satish, Avadhani Narayan G, Kalyanaraman B: Doxorubicin inactivates myocardial cytochrome c oxidase in rats: cardioprotection by Mito-Q. Biophysical journal 96(4): 1388-98, Feb 2009. Galati Domenico, Srinivasan Satish, Raza Haider, Prabu Subbuswamy K, Hardy Michael, Chandran Karunakaran, Lopez Marcos, Kalyanaraman Balaraman, Avadhani Narayan G: Role of nuclear-encoded subunit Vb in the assembly and stability of cytochrome c oxidase complex: implications in mitochondrial dysfunction and ROS production. The Biochemical journal 420(3): 439-49, Jun 2009. Anandatheerthavarada Hindupur K, Sepuri Naresh Babu V, Avadhani Narayan G: Mitochondrial targeting of cytochrome P450 proteins containing NH2-terminal chimeric signals involves an unusual TOM20/TOM22 bypass mechanism. The Journal of biological chemistry 284(25): 17352-63, Jun 2009. Sangar Michelle Cook, Anandatheerthavarada Hindupur K, Tang Weigang, Prabu Subbuswamy K, Martin Martha V, Dostalek Miroslav, Guengerich F Peter, Avadhani Narayan G: Human liver mitochondrial cytochrome P450 2D6--individual variations and implications in drug metabolism. The FEBS journal 276(13): 3440-53, Jul 2009. Biswas, Gopa. Srinivasan, Satish. Anandatheerthavarada, Hindupur K. Avadhani, Narayan G.: Dioxin-mediated tumor progression through activation of mitochondria-to-nucleus stress signaling. Proceedings of the National Academy of Sciences of the United States of America 105(1): 186-91, Jan 8 2008. Devi Latha, Raghavendran Vijayendran, Prabhu Badanavalu M, Avadhani Narayan G, Anandatheerthavarada Hindupur K: Mitochondrial import and accumulation of alpha-synuclein impair complex I in human dopaminergic neuronal cultures and Parkinson disease brain. The Journal of biological chemistry 283(14): 9089-100, Apr 2008. Biswas Gopa, Tang Weigang, Sondheimer Neal, Guha Manti, Bansal Seema, Avadhani Narayan G: A distinctive physiological role for IkappaBbeta in the propagation of mitochondrial respiratory stress signaling. The Journal of biological chemistry 283(18): 12586-94, May 2008. Boopathi Ettickan, Srinivasan Satish, Fang Ji-Kang, Avadhani Narayan G: Bimodal protein targeting through activation of cryptic mitochondrial targeting signals by an inducible cytosolic endoprotease. Molecular cell 32(1): 32-42, Oct 2008. Anandatheerthavarada Hindupur K, Sepuri Naresh Babu V, Biswas Gopa, Avadhani Narayan G: An unusual TOM20/TOM22 bypass mechanism for the mitochondrial targeting of cytochrome P450 proteins containing N-terminal chimeric signals. The Journal of biological chemistry 283(51): 36060, Dec 2008. Srinivasan, Satish. Avadhani, Narayan G.: Hypoxia-mediated mitochondrial stress in RAW264.7 cells induces osteoclast-like TRAP-positive cells. Annals of the New York Academy of Sciences 1117: 51-61, Nov 2007. Sepuri, Naresh B V. Yadav, Sanjay. Anandatheerthavarada, Hindupur K. Avadhani, Narayan G.: Mitochondrial targeting of intact CYP2B1 and CYP2E1 and N-terminal truncated CYP1A1 proteins in Saccharomyces cerevisiae--role of protein kinase A in the mitochondrial targeting of CYP2E1. FEBS Journal 274(17): 4615-30, Sep 2007. Hardy, Micael. Rockenbauer, Antal. Vasquez-Vivar, Jeannette. Felix, Christopher. Lopez, Marcos. Srinivasan, Satish. Avadhani, Narayan. Tordo, Paul. Kalyanaraman, B.: Detection, characterization, and decay kinetics of ROS and thiyl adducts of mito-DEPMPO spin trap. Chemical Research in Toxicology 20(7): 1053-60, Jul 2007. Spear, Joseph F. Prabu, Subbuswamy K. Galati, Domenico. Raza, Haider. Anandatheerthavarada, Hindupur K. Avadhani, Narayan G.: beta1-Adrenoreceptor activation contributes to ischemia-reperfusion damage as well as playing a role in ischemic preconditioning. American Journal of Physiology - Heart & Circulatory Physiology 292(5): H2459-66, May 2007. Guha, Manti. Srinivasan, Satish. Biswas, Gopa. Avadhani, Narayan G.: Activation of a novel calcineurin-mediated insulin-like growth factor-1 receptor pathway, altered metabolism, and tumor cell invasion in cells subjected to mitochondrial respiratory stress. Journal of Biological Chemistry 282(19): 14536-46, May 11 2007. Fang, Ji-Kang. Prabu, Subbuswamy K. Sepuri, Naresh B. Raza, Haider. Anandatheerthavarada, Hindupur K. Galati, Domenico. Spear, Joseph. Avadhani, Narayan G.: Site specific phosphorylation of cytochrome c oxidase subunits I, IVi1 and Vb in rabbit hearts subjected to ischemia/reperfusion. FEBS Letters 581(7): 1302-10, Apr 3 2007. Dasari, Venkata Ramesh. Anandatheerthavarada, Hindupur K. Robin, Marie-Anne. Boopathi, Ettickan. Biswas, Gopa. Fang, Ji-Kang. Nebert, Daniel W. Avadhani, Narayan G.: Role of protein kinase C-mediated protein phosphorylation in mitochondrial translocation of mouse CYP1A1, which contains a non-canonical targeting signal. Journal of Biological Chemistry 281(41): 30834-47, Oct 13 2006. Wang, Ying. Biswas, Gopa. Prabu, Subbuswamy K. Avadhani, Narayan G.: Modulation of mitochondrial metabolic function by phorbol 12-myristate 13-acetate through increased mitochondrial translocation of protein kinase Calpha in C2C12 myocytes. Biochemical Pharmacology 72(7): 881-92, Sep 28 2006. Devi, Latha. Prabhu, Badanavalu M. Galati, Domenico F. Avadhani, Narayan G. Anandatheerthavarada, Hindupur K.: Accumulation of amyloid precursor protein in the mitochondrial import channels of human Alzheimer's disease brain is associated with mitochondrial dysfunction. Journal of Neuroscience 26(35): 9057-68, Aug 30 2006. Prabu, Subbuswamy K. Anandatheerthavarada, Hindupur K. Raza, Haider. Srinivasan, Satish. Spear, Joseph F. Avadhani, Narayan G.: Protein kinase A-mediated phosphorylation modulates cytochrome c oxidase function and augments hypoxia and myocardial ischemia-related injury. Journal of Biological Chemistry 281(4): 2061-70, Jan 27 2006. Biswas, Gopa. Guha, Manti. Avadhani, Narayan G.: Mitochondria-to-nucleus stress signaling in mammalian cells: nature of nuclear gene targets, transcription regulation, and induced resistance to apoptosis. Gene 354: 132-9, Jul 18 2005. Biswas, G. Anandatheerthavarada, H K. Avadhani, N G.: Mechanism of mitochondrial stress-induced resistance to apoptosis in mitochondrial DNA-depleted C2C12 myocytes. Cell Death & Differentiation 12(3): 266-78, Mar 2005. Nikonova, Elena V. Vijayasarathy, Camasamudram. Zhang, Lin. Cater, Jacqueline R. Galante, Raymond J. Ward, Stephen E. Avadhani, Narayan G. Pack, Allan I.: Differences in activity of cytochrome C oxidase in brain between sleep and wakefulness. Sleep 28(1): 21-7, Jan 1 2005. Boopathi, Ettickan. Lenka, Nibedita. Prabu, Subbuswamy K. Fang, Ji-Kang. Wilkinson, Frank. Atchison, Michael. Giallongo, Agata. Avadhani, Narayan G.: Regulation of murine cytochrome c oxidase Vb gene expression during myogenesis: YY-1 and heterogeneous nuclear ribonucleoprotein D-like protein (JKTBP1) reciprocally regulate transcription activity by physical interaction with the BERF-1/ZBP-89 factor. Journal of Biological Chemistry 279(34): 35242-54, Aug 20 2004. Butow, Ronald A. Avadhani, Narayan G.: Mitochondrial signaling: the retrograde response. [Review] [119 refs] Molecular Cell 14(1): 1-15, Apr 9 2004. 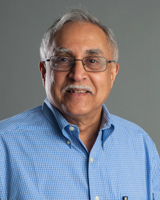 Levy, Richard J. Vijayasarathy, C. Raj, Nichelle R. Avadhani, Narayan G. Deutschman, Clifford S.: Competitive and noncompetitive inhibition of myocardial cytochrome C oxidase in sepsis. Shock 21(2): 110-4, Feb 2004.